Hi everybody! It’s Andy Gesner and the staff from HIP Video Promo. It’s been five years since Parachutes, and fans of rafter-shaking, anthemic rock are still asking: where is America’s answer to Coldplay? Surely there’s a stateside band that can match Chris Martin’s knack for sounding radio-ready and sweeping, yet still strangely intimate? Well, Needtobreathe might just be that band. No matter how cinematic their music becomes, it always seems like brothers Bear and Bryant “Bo” Rinehart are singing somewhere deep inside your head. It helps that their perspectives are so optimistic and forward-looking.Daylight, Needtobreathe’s debut, reverberates with near-spiritual energy. 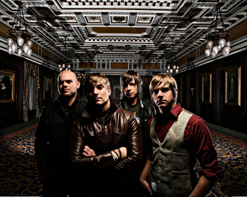 The Seneca, South Carolina quartet has been described as a contemporary Christian band (and has been likened at times to the hugely successful CCM crossover band Switchfoot), and faith and devotion do underpin these hooky, radio-ready tracks. But you’d never notice it if you weren’t looking for it – to the cursory listener, Daylightjust sounds like a bracing collection of modern twin-guitar rock. The Rinehart brothers – named after the legendary coach of the Alabama college football team – have distinguished themselves on the gridiron as well as the rock stage, and there’s definitely something disciplined and hard-hitting about their well-integrated six-string attack. “You Are Here”, the lead single from Daylight, is a perfect example of the usual interplay between the brothers’ instruments. One guitar, heavily effected, blasts away at a recursive riff, while the other walks in precise meter with the tight rhythm section. Over the top of the mix, Bear Rinehart sings lyrics of desperation and last-chance longing, and is joined by his brother in a sweet counterpoint-harmony that suggests hope and redemption. It’s a blast of pure oxygen, and it’s highly reminiscent of the world-famous work of another brother act: the legendary Oasis. Needtobreathe has already made a reputation as a fantastic live act, and garnered a fanatical base of young followers in the Southeast. The quartet will spend Summer ’06 touring across the United States and playing a show nearly every day; in August, they’ll be hooking up with likeminded rock acts at the Love And Heat Tour. Without a doubt, they’ll be playing a venue near you – and most likely, it’ll be the biggest and best in town. Shane Drake, the director of the “You Are Here” video, is no stranger to anthemic rock. Through his Red Van Pictures, he’s shot clips for more than fifty bands, including Fall Out Boy, Armor For Sleep, and Panic! At The Disco; before establishing his own company, the California-based filmmaker worked as editor and cinematographer on countless promo spots. In other words, here’s a camera hawk who knows how to properly frame a young band. He presents Needtobreathe as a rock and roll force, tearing into their instruments with conviction and unquestionable sincerity. Between shots of the group performing “You Are Here” on a black soundstage, Drake intersperses a fractured narrative of a purse-snatching. Good Samaritan Rinehart witnesses the assault, and takes off after the thief – but while the bandit runs in full strides, it seems as though the Needtobreathe singer is running in slo-mo. Just as the robber turns to taunt the singer, serendipity intercedes – and with the help of a red van, Rinehart authors a little street justice. Here at HIP we are ecstatic to be working with our friends Diane Van Horn, Jason Pleskow, and the whole crew at Atlantic Records to bring you this rockin’ new clip! We have plently of copies of Daylight for your on-air giveaway needs. We will also be more than happy to set up video interviews and IDs for you when the Love And Heat Tour comes through your area, so please don’t hesitate to get in touch. If you need more info, call Andy Gesner at 732-613-1779 or e-mail us atHIPVideo@aol.com. You can also visit www.AtlanticRecords.com or www.Needtobreathe.net to find out more about Needtobreathe.